Edward the Confessor died on 5 January 1066. He had no children. Three men wanted to be king of England. Each man thought he had the best claim to the throne. The next king of England would have to win it in a war. Who do you think had the best claim to the throne? Harold Godwinson, Earl of Wessex, a powerful and rich English nobleman. According to the Anglo-Saxon Chronicle, Edward named Godwinson as his successor on his deathbed. The next day, the royal council, known as theWitan, met and declared Godwinson king. An English king was proclaimed by the Witan – this gives Harold Godwinson the only claim to the throne by right. William, Duke of Normandy. The Norman chroniclers reported that Edward had promised his distant relative, William, the throne in 1051. William was the only blood relative of Edward, but the English throne was not hereditary anyway. Claims that Edward promised the throne were probably made up by the rival sides after the event. The Bayeux Tapestry, which was made after the Conquest, shows Godwinson swearing an oath of support to William in a visit to Normandy in 1064. William was supported by the Pope. Harald Hardrada, King of Norway, a Viking warrior. Hardrada based his claim on the fact that his ancestor, King Cnut, had once ruled England (1016‒1035). He was helped by Godwinson’s brother, Tostig. William’s army had been ready since August, but strong winds stopped him sailing until late September. There have been many accounts of the Battle of Hastings. It is difficult to be sure of what happened, but there are some good guesses. In the end William won, but can you think of any reasons why? William gathered an invasion fleet of 700 ships and a large army. William landed at Pevensey on 29 September, built a castle and raided the surrounding area. Harold II marched quickly south from Stamford Bridge. He left many of his footsoldiers behind and exhausted the others. The two sides met at Senlac Hill, near Hastings. 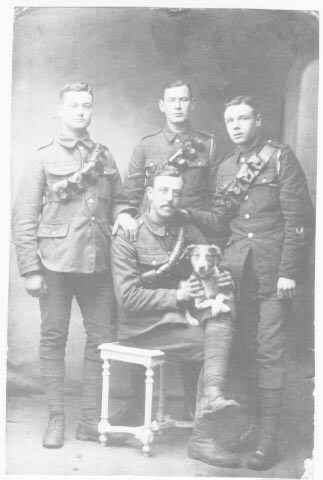 Harold II’s army were at the top of Senlac Hill. They formed a shield wall to protect themselves. The Norman knights could not charge uphill. Some of the Norman soldiers began to flee because they thought William had been killed. William took off his helmet to show them he was still alive. The Normans pretended to run away, then turned and cut down the Saxons when the inexperienced fyrd chased them. William had a well-equipped army. He had knights on horseback and archers with crossbows. Harold II had a traditional Saxon army – hishousecarls fought on foot with axes, the fyrd were just farmers with any weapons they could get. William used archers to break up the Saxon shield wall. The housecarls formed a ring round their king. Harold was killed. It is impossible to know how Harold II died. Most people believe that he was killed by an arrow in the eye. This theory is based on a scene in the Bayeux Tapestry. The tapestry has the words ‘Harold is killed’ next to a man with an arrow in his eye, but it is impossible to know which soldier is Harold II because all the Saxon soldiers are dressed identically. Some English people rebelled against the new ruler including Hereward the Wake in East Anglia and Eadric the Wild in Shropshire. 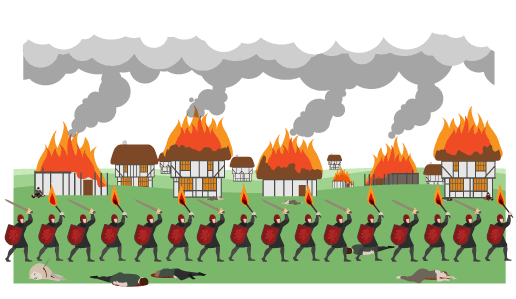 The biggest rebellion was in the north of England in 1069. It was led by Edgar the Atheling, who had a blood-claim to the throne. He was joined by Danish and Scottish armies. William defeated the rebellion. In the north-east of England, he ordered villages to be destroyed and people to be killed. Herds of animals and crops were burnt. Most people who survived starved to death and there were even stories of people turning to cannibalism. This is called the Harrying of the North. Even by the standards of the time, the Harrying was seen as excessively cruel. The Norman Conquest changed the face of England and western Europe forever. 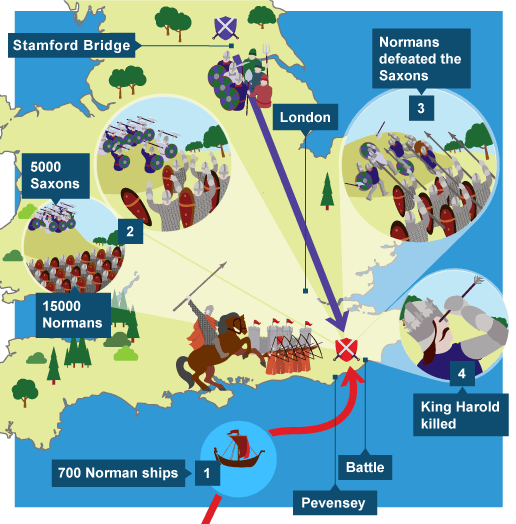 The Norman Conquest broke England’s links with Denmark and Norway, and connected the country to Normandy and Europe. William got rid of all the Saxon nobles and imposed the feudal system on England. The new Norman landowners built castles to defend themselves against the Saxons they had conquered. This gave them great power, and enabled them to rebel against the king. William reorganised the church in England. He brought men from France to be bishops and abbots. Great cathedrals and huge monasteries were built. The Normans treated women much worse than the Saxons had. Norman-French and Anglo-Saxon words make up the English language we use today. For example, royal, law and pork come from Norman-French words, but king, rules and pig come from Saxon ones. Tensions between the English and their new French rulers lasted for at least three centuries. Most historians agree that ‘the Norman Conquest’ is the most important event in the history of England. Sellar and Yeatman (1930) wrote 1066 and All That. This comedic history book joked that 1066 was the only date everybody could remember. The debate about the Norman Conquest has always been, basically, about whether it was a ‘good thing’ or a ‘bad thing’. Even at the time, Anglo-Saxon writers saw it as a disaster and a punishment. The Norman chroniclers, by contrast, portrayed it as a glorious victory by the great and godly Normans. In the 1800s, the great historian EA Freeman saw Harold II as an English nationalist, fighting for our freedom. His rival JH Round portrayed the English as corrupt and out-of-date, and William as the king who brought modern, European ways to England. Generally, popular culture has supported the Saxons. Even recently, the Channel 4 docu-drama Battle for Middle Earth (2009) portrayed the Conquest as the struggle of plucky English underdogs against the nasty Normans. However the BBC series The Normans (2010) stressed how the Normans were great builders, brilliant warriors and tip-top administrators who changed the world. What is your interpretation of the Norman Conquest? 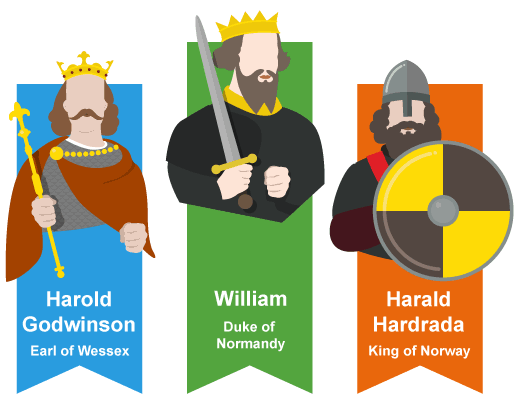 Who did you want to win – Harold or William – and why? Was it a ‘good thing’ or a ‘bad thing’? Why do you think Hollywood has not made a film about it?